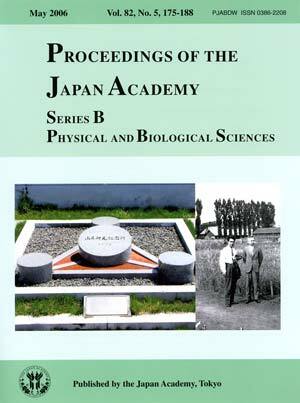 Research into wheat genetics was initiated in 1918 in Sapporo, Hokkaido with planting of pentaploid hybrids. This monument was built at the location where the first research material was planted to commemorate the event. 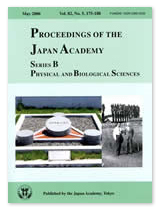 In 1918, Dr. Tetsu Sakamura (a member of the Japan Academy) studied the wheat species that had been collected at the Sapporo Agricultural College (the present Hokkaido University) and discovered that the wheat and its related species (Triticum) contained 7, 14 and 21 chromosomes in haploids with 7 being the basic number. This finding corrected the previous notion that the haploid and diploid numbers were 8 and 16, respectively, for all species. Dr. Hitoshi Kihara (also a member of the Japan Academy) and his colleagues followed up this landmark studies and made great contributions to the wheat genetics until 1986, including chromosome research in interspecies hybrids, genomic analyses, synthesis of bread wheat depending on the finding of ancestral wheats, and cytoplasmic inheritance. This monument designed by the late Man-emon Takahashi (another member of the Japan Academy) symbolizes the genomic analysis. It was constructed in the experimental enclosure in Hokkaido University and unveiled in 1976 as a part of the centennial celebration of the University. A quotation from the review article “Wheat Species: A critique” by A. E. Watkins (J. Genet. 23, 173-263, 1930) that emphasizes the significance of the discovery of the correct chromosome number is inscribed in a copper plate on the pedestal. The photograph on the right taken in 1937 (offered by Ms. Yuriko Kihara) shows Dr. Kihara (left) and Dr. Sakamura (right) standing in front of the experimental wheat area.